As the world joins South Africa in celebrating the life of Nelson Mandela, on the 100th anniversary of his birth, the people of Mmangweni village are not celebrating. A documentary produced by Checkpoint and ENCA recently shared the story of the Mmangweni community taking the O.R. Thambo District Municipality to court after failing to provide basic services. With the help of the Legal Resource Centre, the municipality has now been ordered to deliver water tanks with clean water on weekly basis until piped water arrives and even this has only reached half of the residents. 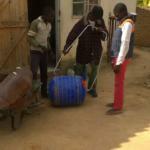 Kristina Gubic started a Fundraiser Page on GivenGain that aims to deliver 20 Hippo Rollers for the community and includes budget for transporting the items from Pretoria to the Eastern Cape. What struck me about the documentary was the incredibly vulnerable state of the population that is mostly made of elderly women who are forced to collect water by hand and manage their household chores single-handedly. – Kristina Gubic. Mmangweni village situated in the Eastern Cape Province in the Nyandeni Local Municipality between Mthatha and Port St Johns is a mostly rural population with little or no infrastructure. The mostly women headed households of an increasingly ageing population rely on water from nearby streams that are shared with livestock and often polluted. 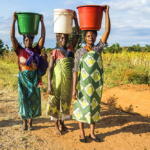 Collecting water remains a labour intensive task where a single bucket carrying just 20 litres must be carried over a kilometre of rugged terrain and requires more than four trips to meet the daily water needs of a household. According to Statistics SA 2011 census, only 2% of households in Nyandeni have access to clean drinking water and only 1% have access to sanitation. There is no doubt that the Father of our Democracy would view this as a betrayal of the Constitution that ensures everyone has access to safe water. 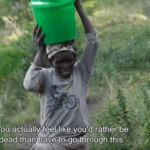 Please share the campaign link (https://www.givengain.com/ap/mmangweni/) and help Kristina make life a little easier for the grandmothers of Mmangweni who should really be sitting with their feet up enjoying retirement, rather than hauling water.